Driven by SunTech’s market-leading Advantage™ BP technology, the new SunTech CT40 is the ideal, affordable solution for clinical-grade spot-check measurements of blood pressure plus vital signs in hospitals and clinics. 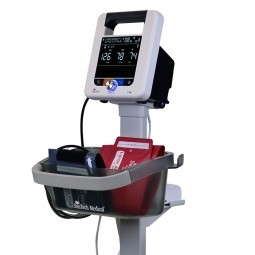 Ambulatory care, long-term care and low-acuity hospital departments can easily implement this versatile, user-friendly vital signs device that delivers SunTech clinical-grade performance, advanced features and digital connectivity. 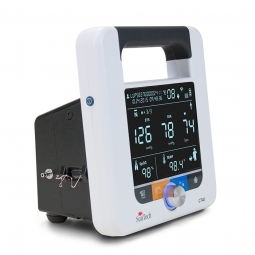 Unique to the SunTech CT40, its modular design allows clinicians to easily make adaptations to the device while in the field – adding thermometry, SpO2 and Wi-Fi based solely on the needs of the patient. Other advanced features include the ability to transmit measurement data directly from the device in accordance with HL7 messaging protocols as well as BP Averaging Mode, a key component to accurate blood pressure measurement and used in the recent SPRINT trial conducted by the National Institute of Health (NIH). Module Quick Start Guide for the SunTech CT40. This video shows the various parts and accessories that come standard with your SunTech CT40 and how to perform the initial setup. This video will demonstrate how to add or remove the optional SpO2 Modules for the SunTech CT40. This video will demonstrate how to add or remove the optional Temperature Modules for the SunTech CT40. This video walks through the user interface on the SunTech CT40 and reviews the various functions of the button panel. This video shows the proper way to measure blood pressure using the SunTech CT40 for both the manual and automatic mode. This video shows how to use BP Averaging on the SunTech CT40. This video shows how to accurately measure pulse oximetry using the 2 different SpO2 modules used with the SunTech CT40. This video shows how to accurately measure temperature using the 2 different temperature modules used with the SunTech CT40. Accuracy (BP): Meets or exceeds ANSI/AAMI/ISO 81060-2:2013 standard for non-invasive accuracy (±5mmHg mean error with 8mmHg standard deviation). Conditions for Use: Operating: 10°C (50°F) to 40°C (104°F) 15 – 90% RH non-condensing - 700 kPa - 1060 kPa. 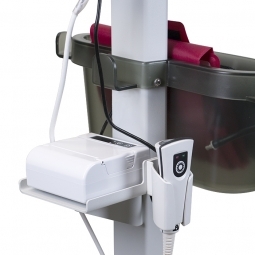 Operating the monitor in an environment at maximum temperature can produce temperatures exceeding 41°C (41.6°C highest recorded) on a patient-applied part. It is up to the operator to determine if this temperature is too high based upon the condition of the patient and, if so, to ensure the ambient temperature of the environment is 38°C or below. Storage: -20°C (-4°F) to 55°C (149°F) 15 – 90% RH non-condensing - 500 kPa - 1060 kPa. Performance can be affected if used or stored outside the specified temperature, humidity, or altitude listed in the ranges above. Power: Internal power supply. Input: 100-240 VAC @ 1.5A max, 50-60 Hz. Output +9VDC @ 5A IEC 320 type input connector. Calibration: The accuracy of cuff -pressure transducers/indicators should be verified bi-annually. Safety Systems: Independent hardware over-pressure circuit and redundant software overpressure algorithm to limit cuff pressure to less than 300 mmHg (+20/-10mmHg). Independent hardware timing circuit and redundant software timer algorithm to limit the duration of a blood pressure cycle to less than 180 seconds. Ingress of liquid: Ingress Protection: IPX1: This device is protected against harmful effects of dripping water per IEC 60529. Masimo® and SET® are registered trademarks of Masimo Corporation. Covidien® and FILAC® are registered trademarks of Covidien AG Corporation. Nellcor® is a registered trademark of Covidien LP Limited Partnership. What is the expected battery life for the SunTech CT40? When batteries are fully charged, the SunTech CT40 is designed to run on internal battery power for 120 measurement cycles (BP, temperature and SpO2 measurements) before requiring recharge. When only the bottom segment of the battery symbol is illuminated, there is between 11 percent and 40 percent battery power remaining. Will the device automatically power down? What is the significance of different beeps I hear during operation? One long beep (approximately 3-second beep): Successful end of BP measurement. Three long beeps: Severe hardware error. One short beep (1-second beep): Power-up or Power-down complete. Four short beeps: There has been an error. If you abort a BP measurement by pressing the Start/Stop button, you will hear one short beep. Then after the pressure has been completely dumped from the cuff, you will hear one long beep. Can pulse oximetry, temperature measurement, a barcode scanner or printer be added later too? Yes, you can add vital signs modules and accessories to the SunTech CT40 at any time. Can EMR connectivity be established at a later date if not enabled as part of initial configuration? Yes, EMR settings can be accessed via the Advanced Configuration Application at any time. Why are no MAP measurements showing on the display? The ability to measure MAP must be turned on using the Advanced Configuration Application. It is turned off by default at the factory. If MAP is enabled, the results will alternate with heart rate results on the display screen. Note that MAP results are only validated for use outside of the United States. Why is no heart rate data showing on the display? 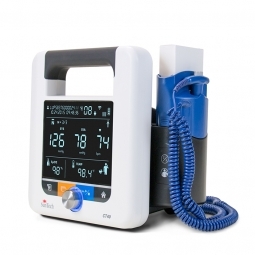 If the device is configured to use the SpO2 sensor as the pulse rate source, and the sensor is not attached to the patient, there will not be heart rate data on the display. Only dashes will appear, or MAP results if MAP measurement is enabled. How many measurements can be stored in the SunTech CT40 memory? Does the CT40 use encryption? Yes, the CT40 offers end to end SSL encryption from the CT40 to the EMR system. If SSL is selected, no plain text data is transferred between the CT40 and the EMR system. SSL can be selected using the Advanced Configuration Application (see document 80-0072-00-MO). When data is transferred by WiFi to a hospital information system is the data encrypted? WPA(2) WiFi encryption may be used to provide encryption on the wireless link for any data transmitted over the WiFi. WPA(2) encryption only encrypts the wireless portion of the transfer, data on the wired hospital network is unencrypted. To ensure end to end encryption, SSL must be used. Is the data on the CT40 encrypted? The data contained within the CT40 is not encrypted, but it is protected via password and/or encrypted communication channels. Easily print & record vitals with the CT40 Thermal Printer. Accurate Blood Pressure Measurement: What is it? Why is it important? Why is it so difficult to obtain a reliable measurement? Discover the Difference with the SunTech CT40 Today! Request more information about the SunTech CT40 for use in your office.